IT WAS 6.20 on a Monday evening. While most people were winding down for the day, a team of five were gearing up for work. Armed with maps, cameras and notebooks, they set off for their weekly "community walk". They are staff from the local planning team of the new Kreta Ayer social service office (SSO) in Sago Lane. By talking to residents and observing happenings in the neighbourhood during these weekly visits, they hope to identify unmet social needs in the community and find ways to plug those gaps. The office, which oversees the Bukit Merah and Outram area, is one of seven which were set up by the Ministry of Social and Family Development (MSF) last month. There is one at Jalan Besar, and five others which are co-located with the Community Development Councils (CDCs). Another two - in Jurong West and Bukit Panjang/Choa Chu Kang - will open by the end of the year. The plan is to create a network of 20 such offices - one for each of the bigger Housing Board towns - in the next two to three years. The offices will administer financial and social assistance programmes under the national ComCare scheme - which was previously handled by the five CDCs. This means that residents no longer need to travel all the way to the CDCs which may be far from their homes. Each office will have a social assistance team and a local planning team. The idea behind setting up the offices, which was announced in February, is to have a dedicated team for each HDB town. This way, the officers will have a more intimate knowledge of what residents need, and they can play the role of a "local" coordinator and planner of social services in each town. THE weekly "community walk" is a good example of the role SSOs can take on. Local help agencies such as the family service centres (FSCs) also conduct these visits, but on an ad hoc basis. "With the frequency that SSOs are doing it, they can better help coordinate outreach efforts with the FSCs and grassroots and we can all share data," said Ms Rachel Lee, senior assistant director of Fei Yue Family Service Centre. During last Monday's community walk, the team from Kreta Ayer SSO covered the area bounded by Jalan Kukoh, Jalan Minyak and York Hill, which has many rental blocks. Trudging up stairs splattered with urine, they headed for their first stop: Kreta Ayer Seniors Activity Centre on the fourth floor of Block 8. A group of seniors had just finished their aerobic exercises and a few were lingering around to chat. 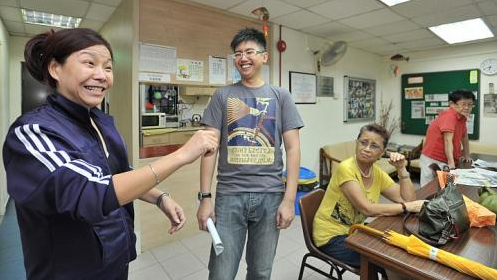 Mr Andre Wai, 32, who heads the local planning team, struck up a conversation with centre manager Cindy Lee Chee Leng, 51, while others fanned out to talk to the seniors. Mr Wai used to be a probation and policy officer at MSF. His teammates were also from the ministry. The visit was fruitful. They found out that of the some 1,000 elderly living in the area, only 300 of them, mostly Chinese, are members of the centre. About 70 of them are on the Government's long-term Public Assistance Scheme. The team's homework for the day: Find out why the Malays and Indians do not use the centre as much, and whether needy elderly know about the public assistance programme. The next stop: The Jalan Kukoh Residents' Committee (RC) where children were attending tuition classes. Most of the children came alone as their parents were either at work or busy at home. RC chairman Yeo Gek Nai said that fewer children now wander about in the neighbourhood. But having more volunteers to coach them would be useful. It was another useful point to note for Mr Jai Prakash, general manager of the Kreta Ayer social service office. The office could help find corporate volunteers, said the 35-year-old, who was previously involved in disability and rehabilitation policy work at MSF. EARLIER in the day, the team met social workers at Thye Hua Kwan Family Service Centre to understand the challenges they are facing. This is another key aspect of the work done by the local planning team. Every day, they meet at least one local community partner - the police, HDB or a voluntary welfare organisation. Feedback will be given to MSF if necessary. After these meetings, the team will also share information with other local agencies and come up with solutions - something not done previously. Said Mr Prakash: "Each of these agencies, whether the police, HDB or welfare groups, is only privy to its own sphere of work. By piecing together the big picture, potential problems and solutions can be identified early." During Monday's meeting, for example, Mr Udhia Kumar, executive director of Thye Hua Kwan FSC at Tanjong Pagar, told the SSO officers that there are not enough childcare centres for the growing number of young families in the area. Said Mr Kumar: "We commonly associate the Tiong Bahru and Chinatown areas with the elderly and there are so many services for them here but not for the young." In the past, such feedback would take at least one or two weeks to reach the MP for the area and the ministry. With the SSOs playing intermediary, input can be gathered faster and more directly. Said Mr Prakash: "That's the role of the SSOs - building on the community's strengths to develop local solutions."